Almost ten years ago, I had the privilege of joining a cast of the nipped, tucked and plucked for an evening of fawning gratitude to Michael Douglas. I so don't belong to this set, but I had an "in." I sucked in my tummy, put on a slinky black dress, and pretended to belong. There we were in the lobby of San Francisco's City Hall, when a publicist ran up to me and Cranky and whispered, "No one is talking to Karl Malden!" Cookiecrumb and Co. to the rescue. He was marvelous! And his wife, Mona... Well, I fantasized that we were going to be BFFs. We chatted. Turns out Malden's Serbian uncle left Chicago and moved to San Francisco, the day before the Great Earthquake. He returned home the next day. Damn ground won't hold still! Karl looked up the grand marble staircase in City Hall, recalling his days on "The Streets of San Francisco." He said, "God, I can't tell you how tired I got of running up those stairs, take after take." And he was in his 60s during the filming of the show. Jeez. I really didn't know how old he was as we stood there getting to know one another. All of a sudden, though, the conversation came to a halt. Karl looked briefly flustered, and patted his pockets. He fished out a little plastic card, pulled something out of his ear, and transferred a fresh battery to his hearing aid. Oh, and the photo. 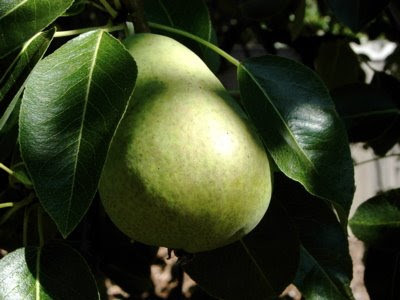 There are at least a thousand pears on the tree in our backyard, ready to start jumping within weeks. Yay, I think. Lucky you don't have a possum - there'd be no pears! you have done all sorts of fabulous things, lady! What a wonderful Karl Malden story....thanks! Now, that's what I call a glittery evening! What ever happened to Catherine Zeta-Jones? Is she still raising Douglas' kids? The Streets of San Francisco now that was T.V.! Great "insider" story. Bless his heart! I loved seeing the old stills from films, this week, showing him in his high-waisted pants. I think I have tracked down my book on pears; will locate it and get it to you. Natalia: I'm sure we all have done fabulous things. This one was pretty special. Sharon Stone and Ellen DeGeneres doing make-out jokes?! Sandwich: Aw. Isn't it a sweet story? Thank you. Zoomie: Did you click the link? It was quite star-studded. Catherine was there; not yet married. Now, she's back to making cell phone commercials. Greg: I never missed an episode. Pow! Kudzu: "Insider"; heh. Hey, did you see him in One-Eyed Jacks, back in the 60s? I fell for him then. What a lovely story, I always thought that he was a good guy. What a memory! Oh, shame on me: I thought of the nose as soon as I saw the photo. I'm so superficial. And what a lousy excuse for a San Franciscan I am: I was a kid when that program was on, and I never even saw it. Man, the '70s were a crappy time for American cities. Anna: I realize how lucky I am. Sweet. Limoncello: You were too young! The rest of us cougars were drooling over the young Michael Douglas.